This dress is Periwinkle and black and is made my Shamrock Stitchery. This dress is in perfect condition, comes with a choice of 2 capes and kick pants, and a crown. There are over 3,000 crystals and I would be more than happy to send more pictures if you are interested. 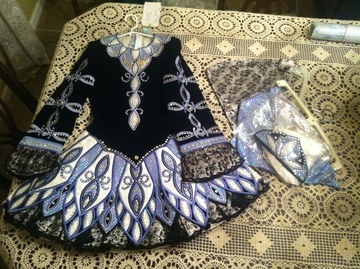 It has been only worn 5 times and shows great stage presence and was originally made at $2,800. Let out room all throughout sleeves, chest, waist, and skirt.